Is Red Dye in Nectar Bad? Can You Feed Hummingbirds in Winter? Adding water to your yard is a great way to attract birds, but a basic birdbath is not a good choice to provide water for hummingbirds. These small, delicate birds need special consideration for an appropriate water source. Backyard birders who provide suitable water for hummingbirds will be treated to unique views of these tiny birds bathing and preening. A typical birdbath is too large and too deep to be suitable for hummingbirds. Because these birds are so small, they need a much shallower water source, and in fact, a bird bath is often the worst choice for hummingbird water. If necessary, a very shallow bath can be made by adding stones to the bath so the depth is not as great, and hummingbirds might take advantage of it. Better water sources for hummingbirds, however, provide clean, fresh moisture in more unique ways. Misters: Positioning a mister to spray nearby broad leaves is the most effective way to provide water to hummingbirds. The noise of the mister will attract the birds, as will the airborne sparkles and glistening leaves, and hummingbirds will rub against wet leaves to bathe. If the mist is light enough, hummingbirds may also fly through it, hover in it, or otherwise get wet directly from the mister's spray. Misting Sprinklers: Adding special sprinkler heads to your lawn or garden can create a mist source that helps water grass or flowers and at the same time will provide water to hummingbirds. This can be a more efficient way to use a mister since any unused water will be absorbed by nearby plants instead of evaporating. Drippers: A slow dripper added to a bird bath or positioned where it will splash on rocks or leaves is another way to provide a hummingbird bath option. The birds may rub against the wet rocks or leaves to bathe or may stand under small drips to get the water directly. The noise from the dripper will also help attract other birds that hear the splashes. Fountains: Birdbath fountains can be especially attractive to hummingbirds because of shallow spots where the water runs over ledges, lips, and rims. These are easy places for hummingbirds to perch and take advantage of the water. Fountains with small bubblers and rough textures such as slate slabs are the best options because they give the birds plenty of space to access the water where they feel safe and comfortable. No matter what water source you provide for hummingbirds, there are easy steps you can take to make the water safer and more attractive to these tiny birds. Clean nozzles frequently so the water flow is steady and fresh, and change the position of the water source regularly so the surrounding area is also clean. Check hoses and spigots regularly to ensure the water flow is uninterrupted. Provide nearby perches for wet hummingbirds to preen and dry. For extra enjoyment, position the perches where you can get a great view of the hummingbirds. Small branches, clotheslines, and wires are all good hummingbird perches. Always monitor the water flow and depth of any puddles or basins to be sure it is suitable for such tiny birds, and make adjustments if necessary. Adding a few extra pebbles or tilting a basin to create a shallow end can easily fix a too-deep bathing area. 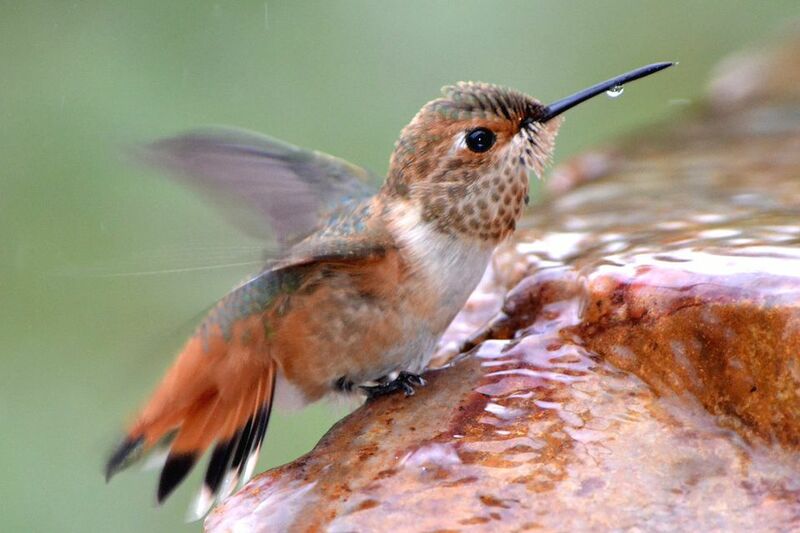 Keep the water source safe from predators that will attack hummingbirds, including cats, snakes, or raptors that don't mind the small morsel of a hummingbird. At the same time, provide safe shelter nearby, such as thorny bushes where hummingbirds can retreat if threatened. Consider planting some of the top nectar-rich flowers for hummingbirds near the water, and the birds will stay nearby to feed as well. The flowers can also help attract their attention so the birds notice the water more quickly. By providing water to hummingbirds, birders can enjoy even more sightings of these spectacular birds. Furthermore, the water will help keep the birds healthy so they will continue to return to hummingbird-friendly backyards for many years.